Small and medium enterprises sector in India has tremendous potential. This sector is rising and hold a great promise. Contribution of the sector to the economy is enormous when we talk about the creating employment for youth of the world’s youngest country. Currently this sector employs more than 80 per cent of the total working capital in India. On the other side a serious concern is also rising in the sector which is related to creating employment in the sector in tune with the rising number of employable manpower in the country. The training being given to the students is more oriented to getting the job andnot that motivatesthem towards entrepreneurship. However, entrepren-eurship is the only option to use the current human resource potentially. Dinesh Agarwal, Founder and CEO, IndiaMART.com in an interaction with our Chief-Editor, Rajen Kumar discusses how entrepreneurship in India can be a viable option for the ever rising human resource in the country. Encouraging entrepreneurship is a key issue in the present competitive business scenario especially when jobs are few and the seekers are many. How can we do it? Entrepreneurship is one of the key elements to create a healthy business ecosystem. Creating a climate that promotes entrepreneurship is critical for economic growth and development. Even though the entrepreneurial trend is quite favourable as seen in the Indian context, there are certain factors that create bottlenecks in giving it a push. 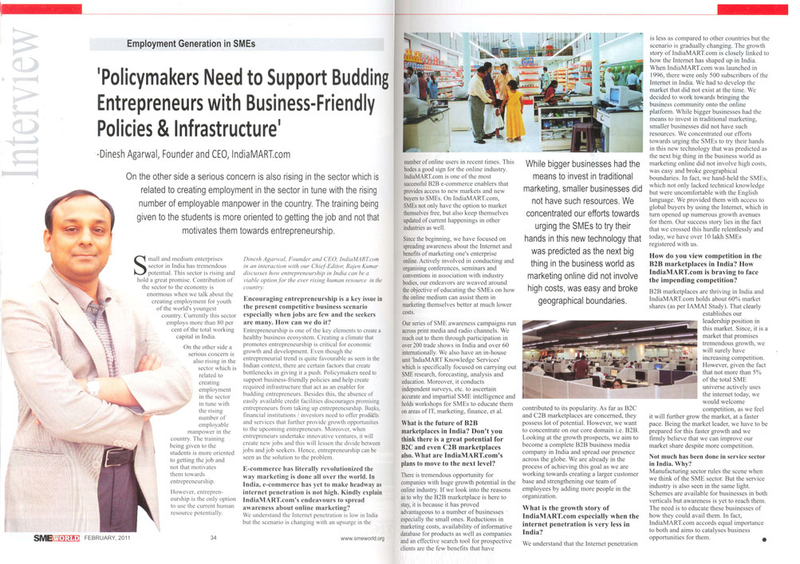 Policymakers need to support business-friendly policies and help create required infrastructure that act as an enabler for budding entrepreneurs. Besides this, the absence of easily available credit facilities discourages promising entrepreneurs from taking up entrepreneurship. Banks, financial institutions / investors need to offer products and services that further provide growth opportunities to the upcoming entrepreneurs. Moreover, when entrepreneurs undertake innovative ventures, it will create new jobs and this will lessen the divide between jobs and job seekers. Hence, entrepreneurship can be seen as the solution to the problem. E-commerce has literally revolutionized the way marketing is done all over the world. In India, e-commerce has yet to make headway as internet penetration is not high. Kindly explain IndiaMART.com’s endeavours to spread awareness about online marketing? We understand the Internet penetration is low in India but the scenario is changing with an upsurge in the number of online users in recent times. This bodes a good sign for the online industry. IndiaMART.com is one of the most successful B2B e-commerce enablers that provides access to new markets and new buyers to SMEs. On IndiaMART.com, SMEs not only have the option to market themselves free, but also keep themselves updated of current happenings in other industries as well. Since the beginning, we have focused on spreading awareness about the Internet and benefits of marketing one’s enterprise online. Actively involved in conducting and organising conferences, seminars and conventions in association with industry bodies, our endeavors are weaved around the objective of educating the SMEs on how the online medium can assist them in marketing themselves better at much lower costs. Our series of SME awareness campaigns run across print media and radio channels. We reach out to them through participation in over 200 trade shows in India and over 60 internationally. We also have an in-house unit ‘IndiaMART Knowledge Services’ which is specifically focused on carrying out SME research, forecasting, analysis and education. Moreover, it conducts independent surveys, etc. to ascertain accurate and impartial SME intelligence and holds workshops for SMEs to educate them on areas of IT, marketing, finance, et al. What is the future of B2B marketplaces in India? Don’t you think there is a great potential for B2C and even C2B marketplaces also. What are IndiaMART.com’s plans to move to the next level? There is tremendous opportunity for companies with huge growth potential in the online industry. If we look into the reasons as to why the B2B marketplace is here to stay, it is because it has proved advantageous to a number of businesses especially the small ones. Reductions in marketing costs, availability of informative database for products as well as companies and an effective search tool for prospective clients are the few benefits that have contributed to its popularity. As far as B2C and C2B marketplaces are concerned, they possess lot of potential. However, we want to concentrate on our core domain i.e. B2B. Looking at the growth prospects, we aim to become a complete B2B business media company in India and spread our presence across the globe. We are already in the process of achieving this goal as we are working towards creating a larger customer base and strengthening our team of employees by adding more people in the organization. What is the growth story of IndiaMART.com especially when the internet penetration is very less in India? We understand that the Internet penetration is less as compared to other countries but the scenario is gradually changing. The growth story of IndiaMART.com is closely linked to how the Internet has shaped up in India. When IndiaMART.com was launched in 1996, there were only 500 subscribers of the Internet in India. We had to develop the market that did not exist at the time. We decided to work towards bringing the business community onto the online platform. While bigger businesses had the means to invest in traditional marketing, smaller businesses did not have such resources. We concentrated our efforts towards urging the SMEs to try their hands in this new technology that was predicted as the next big thing in the business world as marketing online did not involve high costs, was easy and broke geographical boundaries. In fact, we hand-held the SMEs, which not only lacked technical knowledge but were uncomfortable with the English language. We provided them with access to global buyers by using the Internet, which in turn opened up numerous growth avenues for them. Our success story lies in the fact that we crossed this hurdle relentlessly and today, we have over 10 lakh SMEs registered with us. How do you view competition in the B2B marketplaces in India? How IndiaMART.com is braving to face the impending competition? B2B marketplaces are thriving in India and IndiaMART.com holds about 60% market shares (as per IAMAI Study). That clearly establishes our leadership position in this market. Since, it is a market that promises tremendous growth, we will surely have increasing competition. However, given the fact that not more than 5% of the total SME universe actively uses the internet today, we would welcome competition, as we feel it will further grow the market, at a faster pace. Being the market leader, we have to be prepared for this faster growth and we firmly believe that we can improve our market share despite more competition. Not much has been done in service sector in India. Why? Manufacturing sector rules the scene when we think of the SME sector. But the service industry is also seen in the same light. Schemes are available for businesses in both verticals but awareness is yet to reach them. The need is to educate these businesses of how they could avail them. In fact, IndiaMART.com accords equal importance to both and aims to catalyses business opportunities for them.